The “Gruppo di UR” was a group of Italian esotericists who collaborated from 1927 to 1929. The purpose of this group was to study and practice ancient rituals gleaned from the mystery traditions of the world, both East and West, in order to attain a state of superhuman consciousness and power to allow them to act magically on the world. They produced a monthly journal containing techniques for spiritual realization, accounts of personal experiences, translations of ancient texts, and original essays on esoteric topics. The group included a distinguished line-up of occultists, neo-pagans, freemasons, Anthroposophists, orientalists, poets, and members of high society. The prime movers of the group were Arturo Reghini (1878-1946), a Pythagorean mathematician and reviver of a spiritual Freemasonry, and Julius Evola (1898-1974), then a young philosopher with a precocious mastery of the esoteric doctrines of East and West. Many years later, in 1971, Evola gathered these essays into three volumes. Inner Traditions published Volume I in 2001, under the title Introduction to Magic: Rituals and Practical Techniques for the Magus. This volume, the second in the series, complements the first one, yet they are not strictly sequential, and their contents can be read in any order. Volume II shares authentic initiatic wisdom and a rigorous selection of initiatory exercises, including instructions for creating the diaphanous body of the Opus magicum, establishing initiatic consciousness after death, and the construction of magical chains (the enchained awareness of initiates). It offers studies of mystery traditions throughout history, presenting not only the principles themselves but also witnesses to them and their continual validity today. 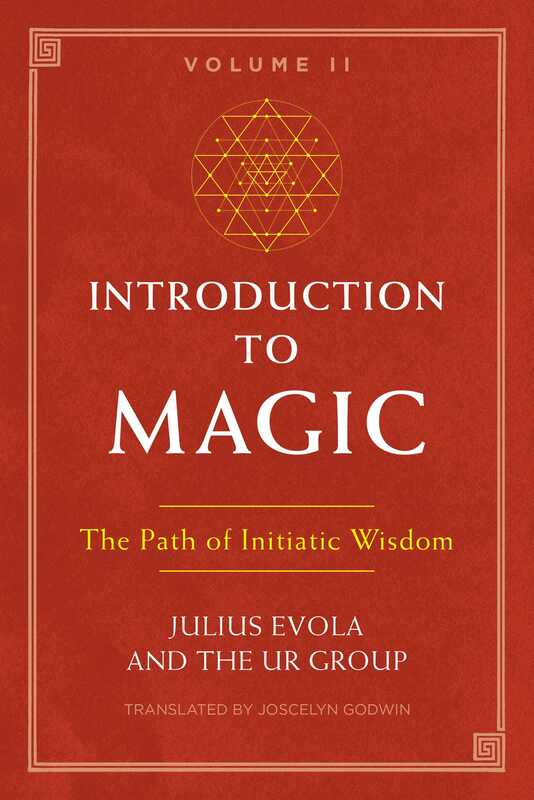 This series shows that the “Magic” of the UR Group meant an active and affirmative attitude toward individual development, handed down from a “primordial tradition” and discernable in alchemy, Hermetism, esoteric religious doctrines, indigenous practices, Tantra, Taoism, Buddhism, Vedanta, and the pagan mysteries of the West. Although some of the practical experiments demanded extraordinary efforts, both individual and collective, there is incalculable value here even for the less heroic, for merely reading these essays leaves a permanent mark on the reader. The following instructions concern those students of esoteric science who, having found among themselves sufficient spiritual affinity and seriousness of intention, wish to organize a chain that will eventually be able to contact other chains, created on the same principles by other groups and in other places. We presume that a chain set up in this manner has an essentially initiatic purpose. Thus above all else and any incidental intention, it aims to promote and develop realization of a spiritual type suitable to each member. Such a chain will be marked by particular types of activity, awareness, and individuality. In some kinds of chain the individuals are simply thrown together, and the polarity of masculine and feminine necessary for operations is not reflected harmoniously in every member. Instead, they separate into the opposition of the fluid, passive mass formed by the majority, and the active role of a leader. But in the type of chain proposed here, every member must distinctly and firmly possess self-awareness, control, and mastery: thus both aspects of the Hermetic complementarity. Each must participate in the chain as an individual, as a distinct force. The chain formed by such individuals will become compact and positive in every way when, through repeated meetings, the various distinct elements become attuned and form a unity. Following this intention, every group will cohere by means of an essentially dynamic symbol such as the pentagram, which will be cast projectively, i.e. from right to left. The emissive way of drawing (from left to right) is limited to the symbol of the circle, to be drawn before the pentagram not so much for insulation as for accumulating the individuals’ energies. For the same reason, unlike what might suit a purely ceremonial magic, one does not rely simply on the strength of the collective ritual and of quasi-automatic elements (ex opere operato). On the contrary, this requires that for a good while, both before and during the meetings, the members should work energetically on themselves, with their own energies, so that they can contribute actively to the firm structure of the chain. We will begin by outlining the discipline that the members chosen by the group leaders must observe individually, uninterruptedly, with firmness, intelligence, and zeal. These are mostly exercises already described in the first volume of this collection, but which we will now organize as a daily program. One must persevere at them until one feels their result in an abandonment of the usual, lethargic attitude toward things and toward oneself, which is the chief obstacle to initiatic realization. 1) Awakening a greater intelligence toward natural phenomena, so that the sense of life extends rhythmically beyond oneself. We will dwell for now on the basic phenomenon of the succession of day and night. 2) Training the mind in dynamic concentration, consisting in the tracing and projection of figures and symbols inside oneself. 3) Training the spirit in fixity. 4) Strengthening in the course of daily life the sense of the continuity and presence of oneself. 1) For the first point, practice the contemplations before sleeping and immediately on waking, with the symbols of the “sun” and the “mountain.” Where the outer light declines, the inner light arises. In the evening, before sleep, in a calm mood, not exhausted in body and especially not in mind (the habit of taking a bath before bed is a useful restorative), visualize a slow sunrise while you see and feel yourself climbing a mountain, up to an imaginary midday peak corresponding to the depth of night in the physical world. Then fix this idea: “I AM THE LIGHT.” Accustom yourself to sinking into sleep with the mind on the one idea of the nocturnal sun at its zenith, calmly refusing every other thought or image that may arise. In the morning, free the mind from any residual sleepiness, then re-evoke the nocturnal sun at the zenith where you left it, and imagine that it is going down, while you yourself descend from the peak. The dawning of the physical sun and the awakening in the physical body mark the moment of return to this world of darkness, from which you took leave last night, with the nocturnal light. Nonetheless, evoke the sense of this nonphysical and invisible light, and while trying to retain it, say: “THE LIGHT IS IN ME.” Carry that as the very meaning of being awake, aware, and active as an individual among external things. Feel that the light in your own soul is stronger than the external light. This sense increases until midday, then declines in the evening, when you retreat from that battle position which is our life as humans, and reenter the world of light. These contemplations must become alive. If not, they are fruitless. They should lead to an awareness of day and night; to a sort of subtle sensitivity to the various hours; to perceiving a rhythm in which the inner and the outer meet. Do not suppose that this demands a special kind of life removed from normal occupations. The purpose is all the better served when the discipline is not kept separate from those but succeeds in affirming itself in the thick of everyday life. No one, however busy during the day, lacks moments of pause when his thoughts wander at random or dwell on his concerns. These moments can be used instead for recollection to higher consciousness: for example, for feeling the present time of day and paying attention to the sense of the “hour,” to the degree of light of one’s own consciousness and one’s own energy.